Scott Wallace making camp in the Amazon in 2002. Scott Wallace interviewing Sydney Possuelo in the Amazon in 2002. The Guajajará patrol in 2017. National Geographic: Isolated Nomads Are Under Siege in the Amazon Jungle - "The government agency responsible for indigenous affairs is Fundação Nacional do Índio, or FUNAI. The agency’s Department of Isolated and Recently Contacted Indians has placed Arariboia at the top of a list of Amazonian flash points, where tribes are at greatest risk of imminent contact. But severe cuts to FUNAI’s budget have made it all the more challenging to safeguard isolated tribes such as the Awá from the inexorable pressures of a resource-hungry global economy." Thousands of migrants from Central America are making their way to the U.S. border. The publicity over the caravan has prompted President Donald Trump to stir up fears over immigration. But one refugee resettlement organization is encouraging people to look beyond the headlines. 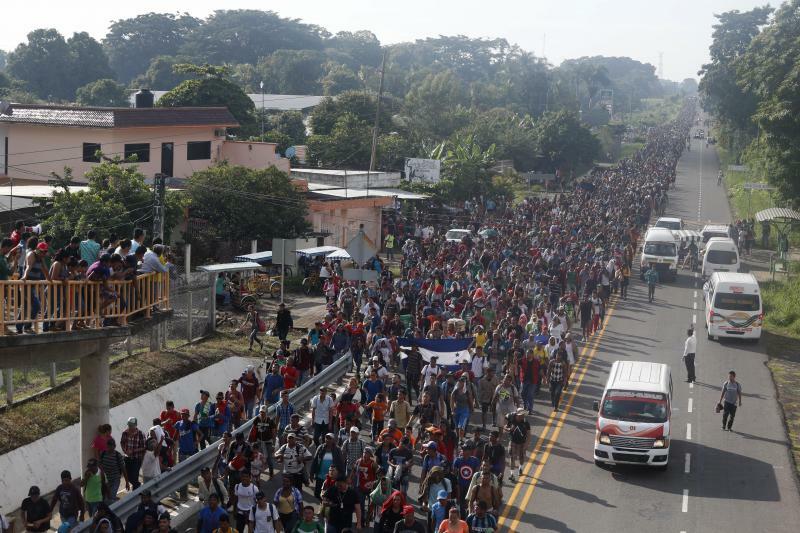 A growing crowd of Central American migrants in southern Mexico resumed its advance toward the U.S. border on Sunday. The numbers have overwhelmed Mexican officials' attempts to stop them at the border. This hour, we sit down with Pulitzer Prize-winning photojournalist Lynsey Addario. We talk about her career and her new book, Of Love & War, and learn about her upbringing in Westport, Connecticut. Later, we discuss the effects of trauma on journalists and other members of the media. Bruce Shapiro of the Dart Center at Columbia University joins us, and we also hear from you.